Known as "Nicky Cigars" and "Nicky Mouth," Santora was a longtime member of New York's Bonanno Crime Family. His underworld leadership role was revealed by the FBI's "Donnie Brasco" undercover operation. Though sentenced to a long federal prison term, Santora regained his status in the Bonanno organization following his release. Born in New York City on November 19, 1942, Santora began getting in trouble with the law as a young adult in the 1960s. Over time, he became an important member of the Bonanno organization, engaged in rackets in Brooklyn and Queens. "Nicky Cigars" may have been related to another underworld-connected Nicholas Santora who was murdered in his Maspeth, Queens, home in 1973. That Santora, age sixty-four, was found dead, face down on his kitchen floor, the back of his head battered by a blunt instrument. Police noted that the victim, retired from a trucking company, had been arrested for minor gambling and policy racket offenses. The FBI arrested "Nicky Cigars" in spring 1981, charging that he and four others had been stealing millions of dollars' worth of tin ingots. The arrests stemmed from the 1979 discovery of stolen ingots at a smelting company in Brooklyn. The disposition of this case is uncertain, but Santora and the rest of the Bonanno Crime Family soon had far more serious concerns. Just a few months later, the Bonanno Family became aware that they had been infiltrated by an undercover FBI agent. Special Agent Joseph Pistone, posing as a jewel thief named Donnie Brasco, had been working his way into the Mafia since September 1976. By midsummer 1981, Pistone was a trusted associate of the Bonanno clan and on the threshold of Mafia induction. He was especially close to Benjamin "Lefty Guns" Ruggiero, powerful capodecina Dominick "Sonny Black" Napolitano (who served as street boss for the imprisoned family leader, Philip "Rusty" Rastelli) and capodecina Anthony Mirra. As the FBI pulled Pistone out of his undercover assignment, there was concern that Ruggiero, Napolitano and Mirra would be in danger when underworld colleagues learned they had exposed the organization to an FBI agent. FBI Special Agent Douglas Fencl was assigned to alert the Mafiosi to their jeopardy. He met with Dominick Napolitano and Nicholas Santora in Brooklyn. He explained the multi-year Brasco operation to the skeptical crime figures and showed off a photograph of himself and several other FBI agents with Pistone as proof. Fencl offered protection to Napolitano, but "Sonny Black" declined. Police investigate Mirra murder. NY Daily News. Napolitano disappeared days later and was widely presumed dead. Mirra was murdered in mid-February 1982. His body was found slumped behind his still-running automobile, four bullet wounds in his head, in a parking garage at 80 North Moore Street in Manhattan. 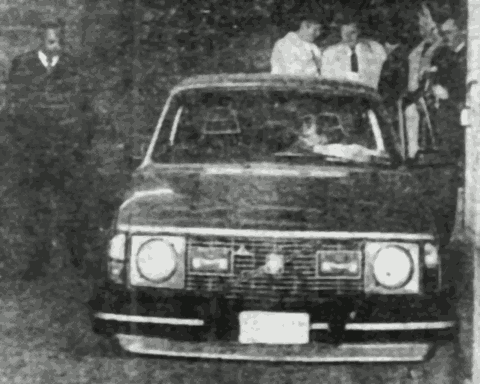 Ruggiero was arrested on his way to a meeting with Bonanno higher-ups on August 29, 1981. The arrest likely saved his life. Pistone's information led a Manhattan grand jury in November 1981 to indict Santora, Napolitano (listed as missing at the time), Ruggiero and John "Boobie" Cerasani for racketeering and murders. They were charged with involvement in the killings of three rebellious Bonanno "captains": Alphonse "Sonny Red" Indelicato, Philip "Lucky" Giaccone and Dominick "Big Trin" Trinchera. Those murders were linked to a power struggle within the Bonanno Family following the murder of Carmine Galante. Two other Bonanno members - Antonio "Boots" Tomasulo and James "Jimmy Legs" Episcopia were charged with conspiracy in the same indictment. Among a large number of pretrial motions were a Ruggiero request for bail reduction and a government request to keep secret the identities of two undercover agents. Both of these were denied by Judge Robert W. Sweet. Noting that the lead defendant in the case was missing and that the Mafia was calling for the murder of Ruggiero, the judge decided that Ruggiero's high bail was appropriate. The judge determined that protecting the identities of undercover agents would prevent the defense from effectively cross examining them at trial. The list of defendants changed by the time trial began July 26, 1982. Five defendants - Santora, Ruggiero, Tomasula, Cerasani and Anthony "Mr. Fish" Rabito - were brought before Judge Sweet. Two other defendants, Vincent Lopez and Vincent Piteo, pleaded guilty to conspiracy charges. Pistone delivered devastating testimony in the case. In one colorful statement, he recalled hearing Santora tell of the murder of hefty "Big Trin" Trinchera: "Nicky said, 'You should have seen when they shot him - fifty pounds of his stomach went flying.'" The FBI agent said Santora expressed disappointment that Alphonse Indelicato's son Bruno had escaped hit men sent to kill him. "He mighta crawled into a hole, you know, and stayed there for a while," Santora said. "If he comes out of it, we'll get him, you know." Santora, Ruggiero and Tomasulo were convicted August 27 of the principal racketeering conspiracy charges in the case. Cerasani and Rabito were acquitted of the principal charges, but Rabito was convicted of a related drug-selling offense. Judge Sweet scheduled sentencing for October and then put it off until mid-November. The judge on November 15 handed out sentences totaling 58 years. He sentenced "Nicky Cigars" Santora and "Lefty Guns" Ruggiero to fifteen years in prison. He sentenced Rabito to thirteen years and Tomasulo to five years. Tomasulo's sentence was later overturned on appeal. Vincent Lopez and Vincent Piteo, who earlier pleaded guilty, were given sentences of six years and four years, respectively. As the sentences were imposed, authorities revealed that a corpse found months earlier had been identified as the missing "Sonny Black" Napolitano. The badly decomposed body, missing its hands, was discovered August 12 near a creek between the end of South Avenue and Mariners Harbor in Staten Island. It was held within a hospital body bag and apparently had been buried before being exposed by recent heavy rains. Santora and Joseph Massino reportedly ordered the hit on Napolitano as a penalty for his welcome of Brasco. A little more than five years later, the story of Special Agent Pistone's undercover work was released as a book, Donnie Brasco: My Undercover Life in the Mafia. The book was authored by Pistone, working with Richard Woodley. About the time Santora regained his freedom, an enormously popular movie, somewhat loosely based on Pistone's book, hit the theaters. Donnie Brasco, starring Johnny Depp as Pistone/Brasco and Al Pacino as Ruggiero, was released at the end of February 1997. A character named Nicky and played by actor Bruno Kirby was based on Santora. Despite this exposure, Santora rejoined the Bonanno Family in a capodecina role and resumed his criminal career. That career would last until July 2012. At that point, Santora, age seventy, pleaded guilty in federal court to extortion. He was sentenced to another twenty months in prison. He served that term at the low-security Federal Correctional Institution outside of Loretto in western Pennsylvania. In July 2013, while he was behind bars at the FCI, Manhattan prosecutors unsealed a 158-page indictment for enterprise corruption (state version of the federal offense of racketeering). In it Santora and eight Bonanno crew members were charged with extortion, loan sharking, labor union control, online sports betting and plotting to sell medications on the black market. Santora's release from federal prison on October 23 of that year merely meant a transfer to the New York City jail on Rikers Island to await trial. He was held with high bail through a two month proceeding that ended May 10, 2016, in a mistrial. He continued to be held in jail on a $1 million bond while prosecutors planned to retry him and his codefendants. Prosecutors reportedly insisted on the high bail figure after a Santora prison telephone conversation suggested that Santora was trying to smuggle a firearm into the jail. Santora claimed that his comment was misunderstood. In the months that followed, his codefendants reached plea deals, but "Nicky Cigars" mantained his innocence. The lengthy incarceration cost the aging Mafiosi his health. Santora suffered with vertigo and frequently fell. He repeatedly injured his head and became weak and disoriented. Eventually, he had difficulty just remaining conscious. He was released on bail in January of 2017. A day after his release, he suffered a serious fall, further injuring his head and face. He was placed in a hospital in New York's Nassau County. His daughter Gina brought complaints about his jail treatment to the press, while a lawsuit was filed against corrections officials for failing to render appropriate help and care. "The Department of Correction has humiliated him, caused him to be permanently injured and deprived him of constitutional, civil and human rights," the suit charged. A retrial on the enterprise corruption charge was penciled in for April 2017. But Santora's failing health prevented it. "Nicky Cigars" Santora passed away October 27, 2018. The New York State enterprise corruption case against him was finally discarded after five years, three months and eighteen days. 1 - New York City Birth Index, Ancestry.com; McKinley, James C. Jr., "Prosecutor details links to mob clan as trial starts," New York Times, Feb. 10, 2016, p. 18. 2 - "Gambling figure found battered, slain in kitchen," New York Daily News, Aug. 16, 1973, p. 63; Social Security Death Index. 3 - "5 arrested by FBI in tin hijacking," New York Times, March 20, 1981, p. B3; "FBI arrests five N.Y. men for theft of $6M worth of tin," Hackensack NJ Record, March 20, 1981, p. 3. 4 - Pistone, Joseph D., with Richard Woodley, Donnie Brasco: My Undercover Life in the Mafia, New York: New American Library, 1987. 5 - Marzulli, John, "Mob capos in fix nixed FBI assist," New York Daily News, June 5, 2004, p. 12. 6 - Doyle, Patrick, and Robert Lane, "Mob drug trafficker found slain in garage," New York Daily News, Feb. 19, 1982, p. 15. 7 - United States v. Napolitano, 552 F. Supp. 465 (SDNY 1982), July 15, 1982, Justia, justia.com. 8 - U.S. v. Napolitano; Hanrahan, Thomas, and Paul Meskil, "Indict 4 in mob rubouts," New York Daily News, Nov. 25, 1981, p. 5. 9 - U.S. v. Napolitano. 10 - "5 linked to Bonanno begin trial for racket," Binghamton Evening Press, July 27, 1982, p. 9; Lubasch, Arnold H., "6 get jail terms in rackets case tied to mobsters," New York Times, Nov. 16, 198, p. B1. 11 - Lubasch, Arnold H., "Undercover agent describes discussions of mob murders," New York Times, Aug. 5, 1982, p. B1; Pienciak, Richard T., "Mafia," Binghamton Evening Press, Aug. 9, 1982, p. 9. 12 - Lubasch, Arnold H., "3 of 5 convicted of conspiracy in Bonanno Family rackets," New York Times, Aug. 28, 1982, p. 1; "FBI secret agent helps get three in mob convicted," St. Louis Post-Dispatch, Aug. 28, 1982, p. 2. 13 - Lubasch, "6 get jail terms..."; Schmetterer, Jerry, and Paul Meskil with D.J. Saunders, "Victim was mobster who let fed agent in," New York Daily News, Nov. 16, 1982, p. 3; Pistone, Joseph D., p. 373. 14 - Schmetterer, Meskil with Saunders, "Victim was mobster..."; Pistone, Joseph D.,p. 370. 15 - Pistone, Joseph D.
16 - "Donnie Brasco," Internet Movie Database, imdb.com. 17 - Buettner, Russ, and William K. Rashbaum, "Bonanno Family members are accused of branching out online and into pills," New York Times, July 10, 2013, p. 21; McKinley, James C. Jr., and Rick Rojas, "State judge calls mistrial in fraud case tied to Mafia," New York Times, May 11, 2016, p. 21; McKinley, "Prosecutor details..."
18 - Buettner and Rashbaum, "Bonanno Family members..."
19 - McKinley and Rojas, "State judge calls..."
20 - DeStefano, Anthony M., "Suit by reputed mob captain Nicholas Santora targets Rikers," Newsday, newsday.com, Feb. 16, 2017. 21 - Jacobs, Shayna, "Nicholas (Nicky Cigars) Santora died awaiting re-trial for racketeering in Manhattan: DA," New York Daily News, nydailynews.com, Jan. 4, 2019. 22 - Jacobs, "Nicholas (Nicky Cigars)..."; Brown, Stephen Rex, "Aging Bonanno Family underboss 'Nicky Cigars' sues city over multiple falls under correction officers' watch," New York Daily News, nydailynews.com, Feb. 14, 2017; DeStefano, "Suit by reputed..."; Marsh, Julia, "Reputed Bonanno boss 'Nicky Cigars' sues city over failed hit," New York Post, nypost.com, Feb. 14, 2017. 23 - Marsh, "Reputed Bonanno boss..."
24 - Jacobs, "Nicholas (Nicky Cigars)..."